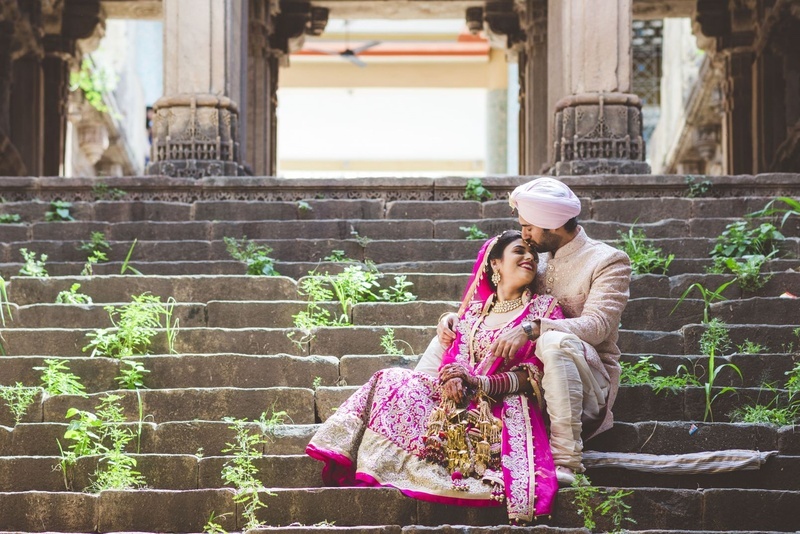 This wedding was a beautiful amalgamation of rich colours, heritage elements and ton of high notes. 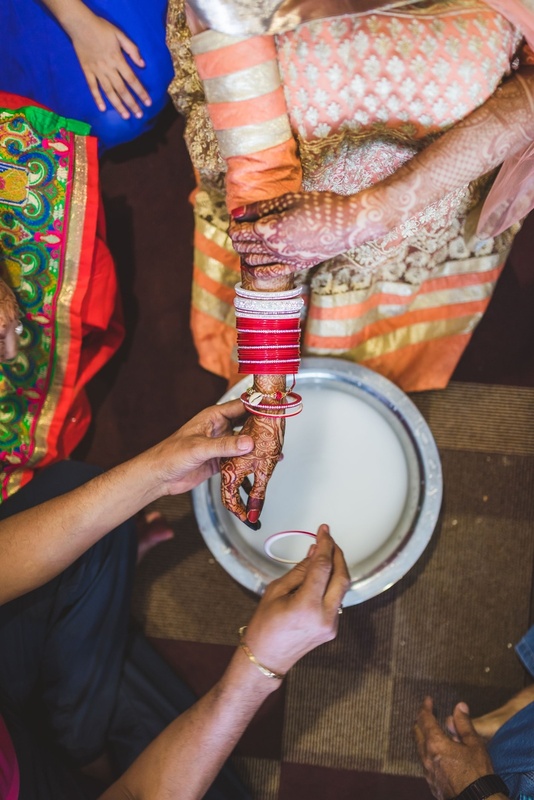 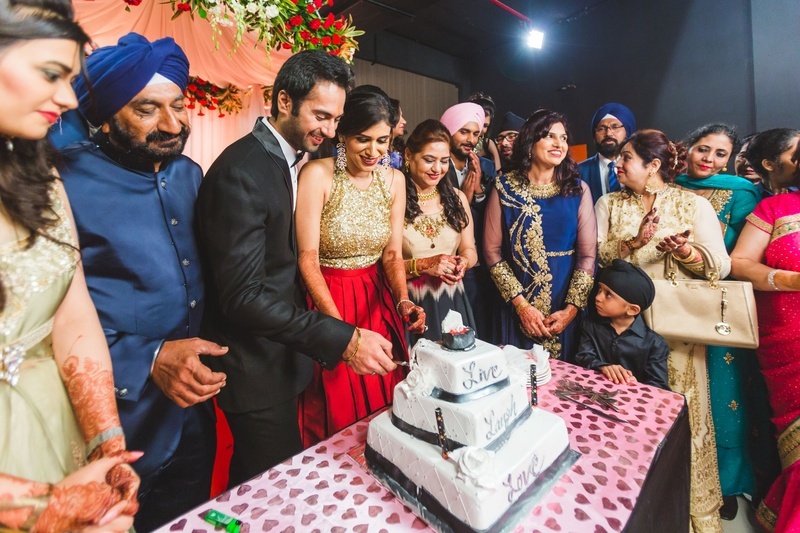 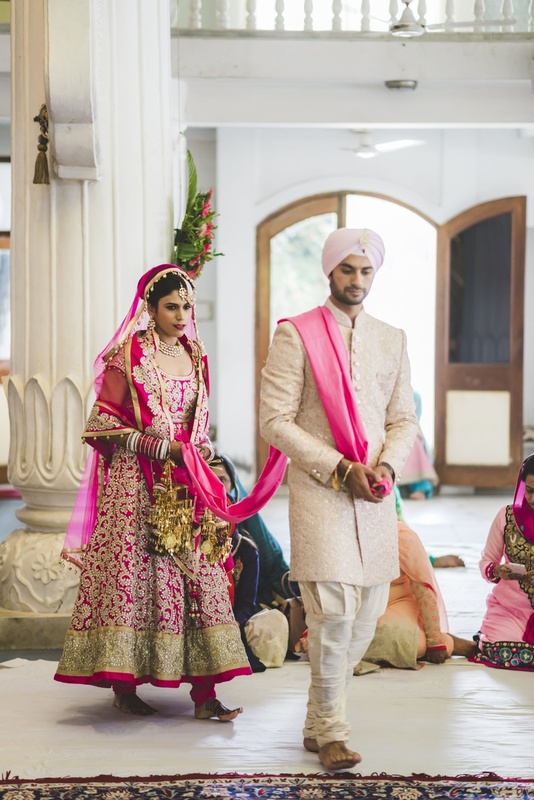 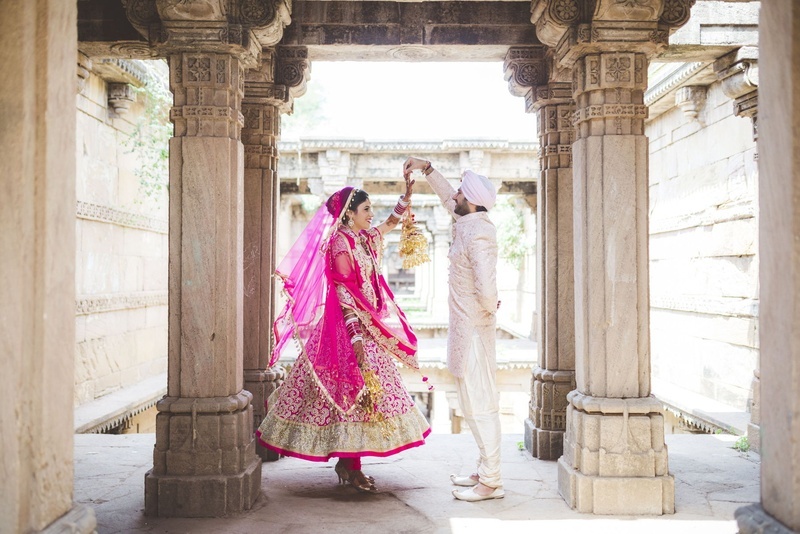 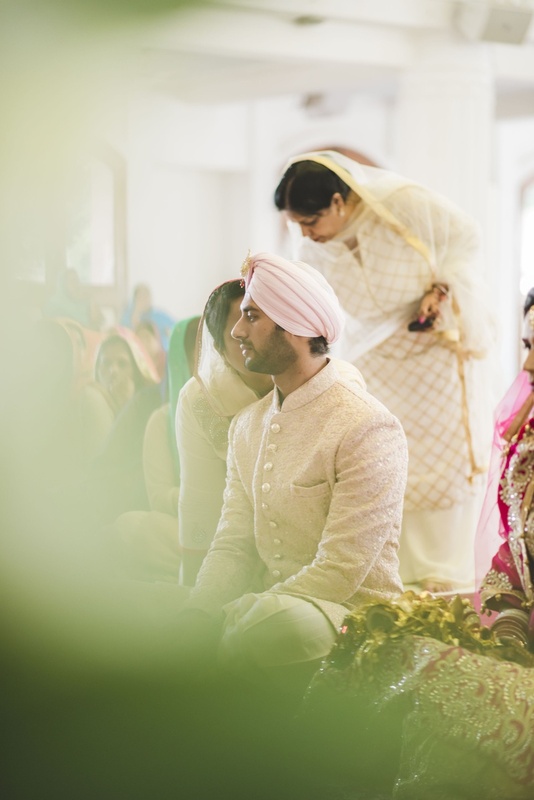 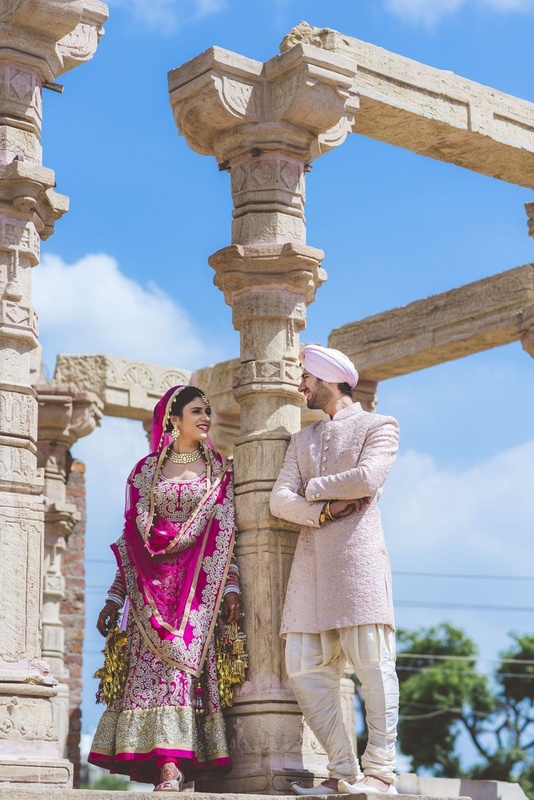 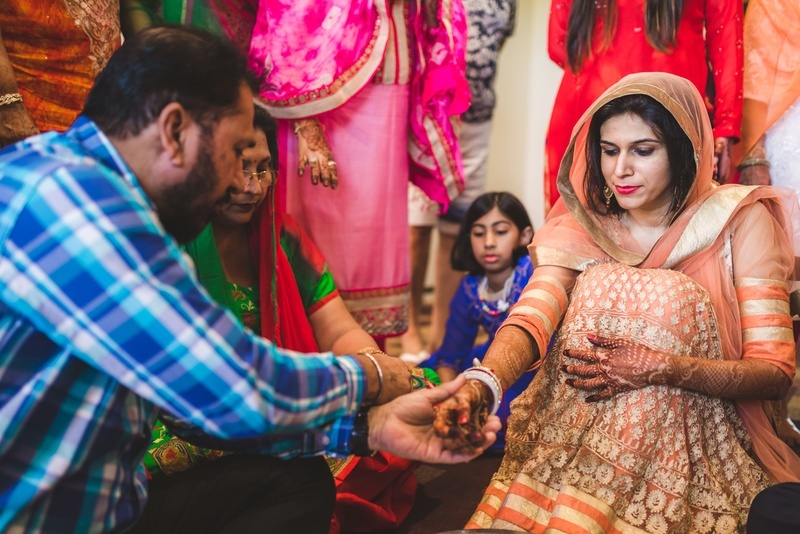 Like all Indian weddings, Gurpreet and Sanmeet's wedding in Ahmedabad was a beautiful amalgamation of rich colours, heritage elements and ton of high notes. 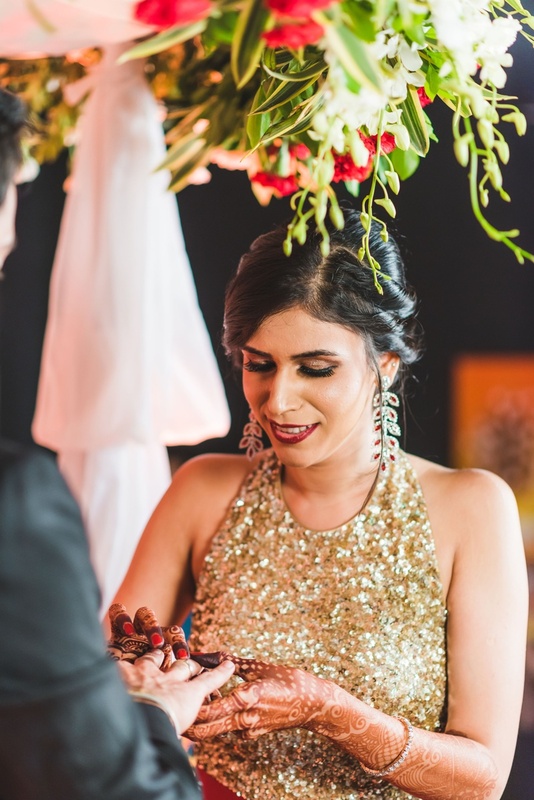 What we especially noticed and loved is the unique neckpieces Gurpreet wore through the wedding. 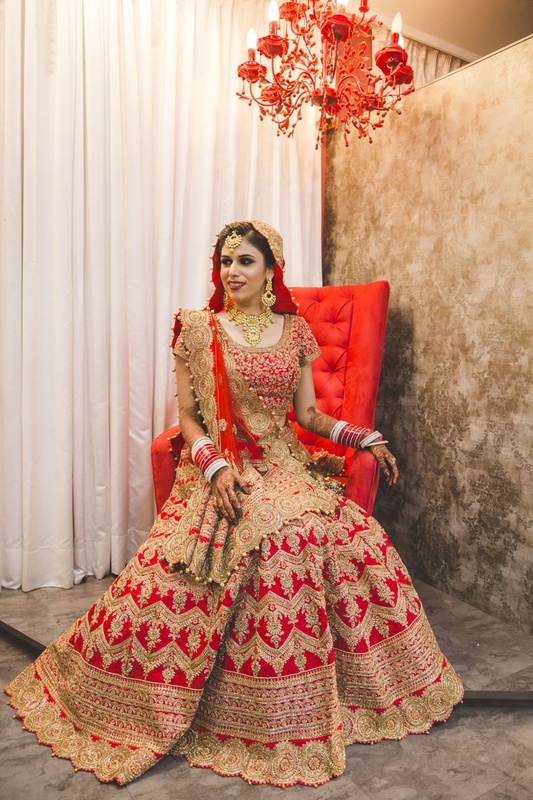 Look out for the stunning red lehenga which she paired with a one-of-a-kind diamond-gold neck-piece. 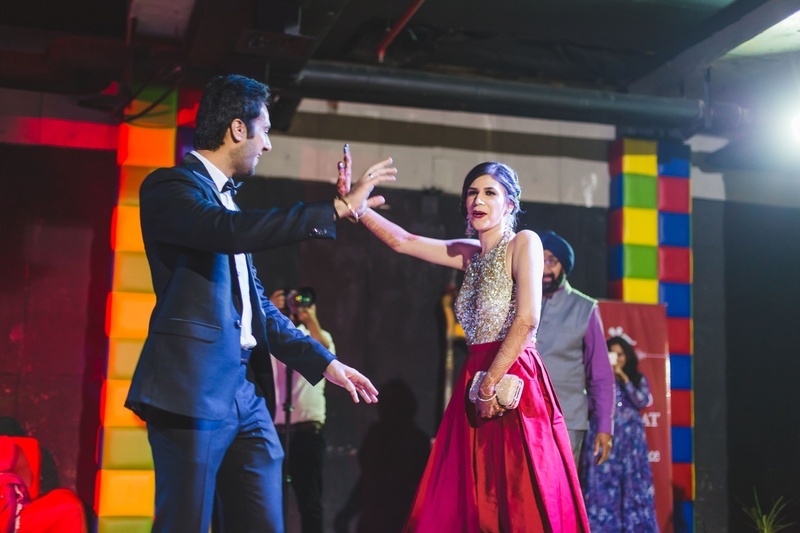 Kudos to Team Varun's Click for capturing some brilliant frames! 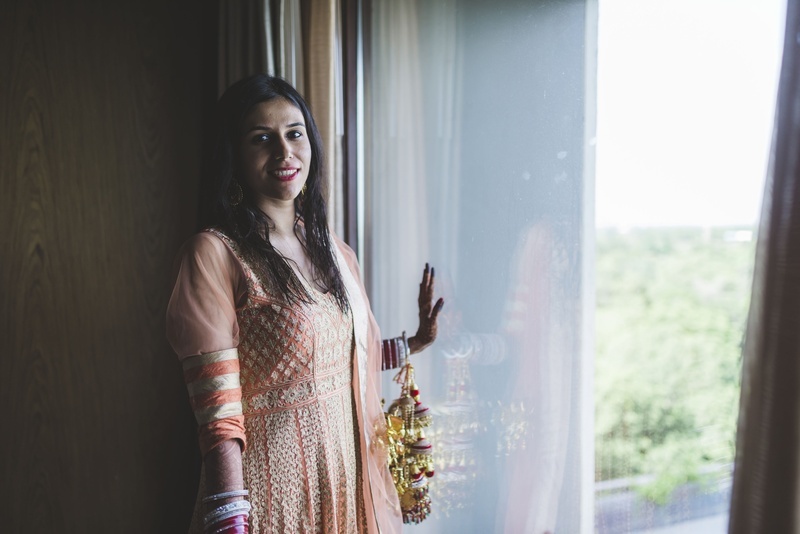 Getting ready for the engagement and sangeet ceremony held at Alcor Hotel, Ahmedabad. 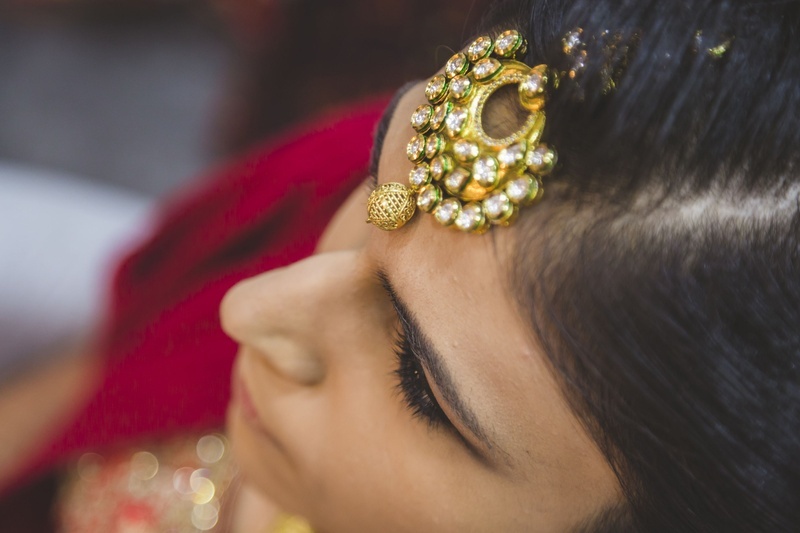 Bridal makeup and jewellery by Orange the salon. 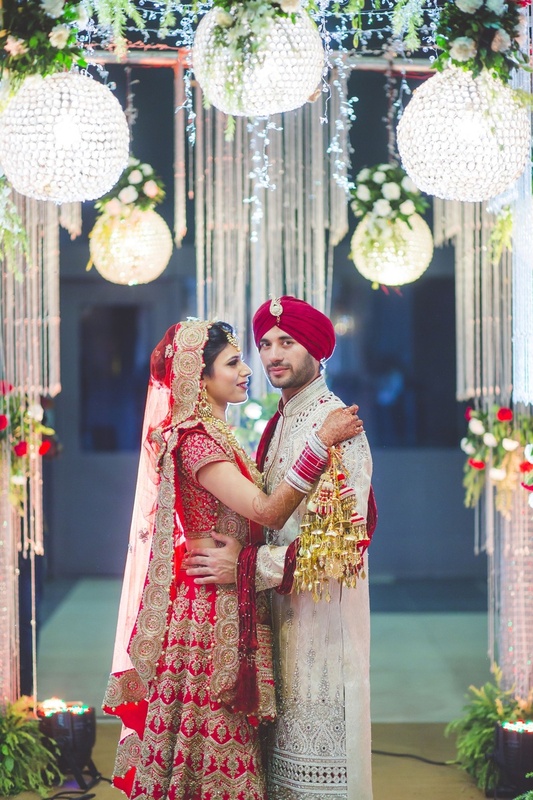 Bride in red silk umbrella skirt paired with gold glitter top by Frontier Raas. 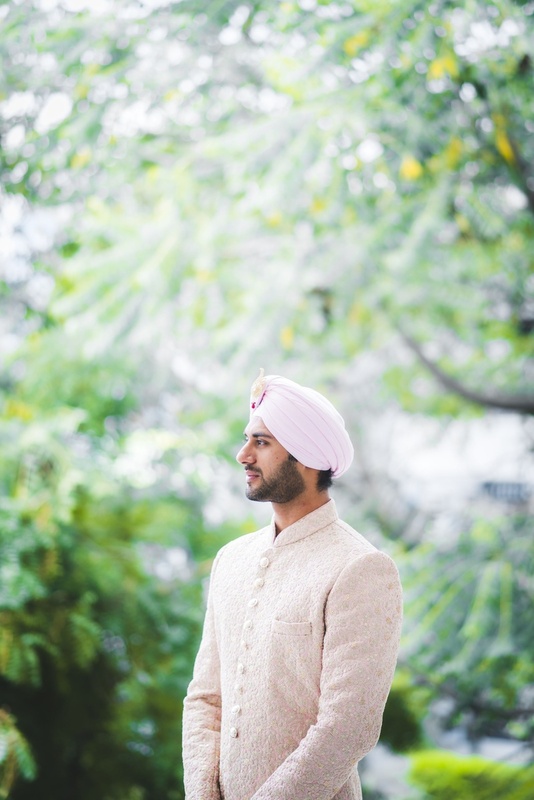 Groomswear by Male Order, Ahmedabad. 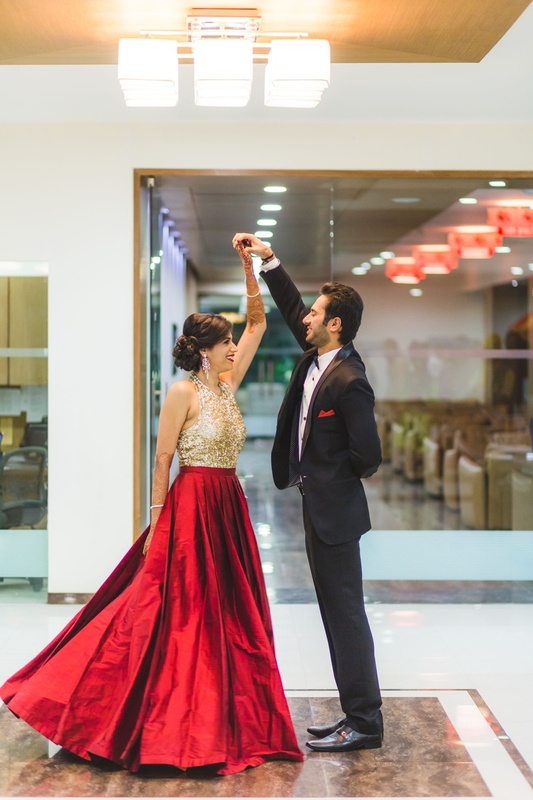 Bride and groom at a performance at their wedding engagement and cocktail bash. 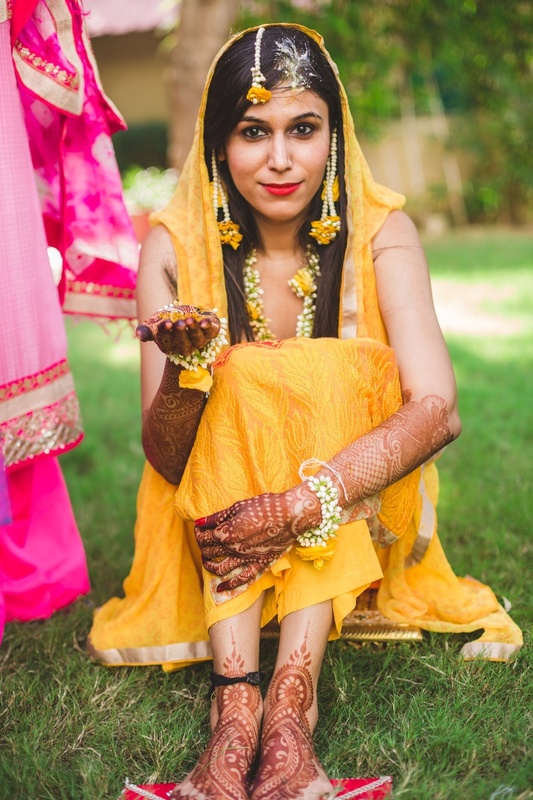 Wearing bright yellow suit styled beautifully with floral jewellery for the haldi ceremony. 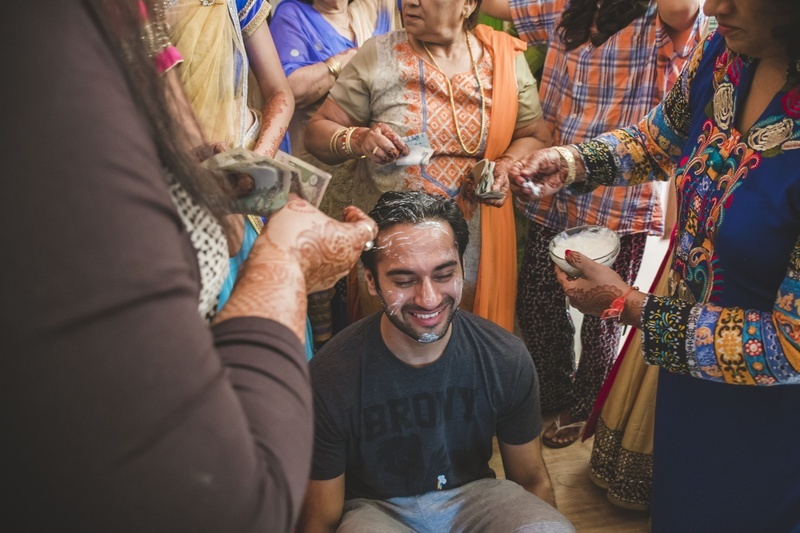 Drenched in Haldi by his family members. 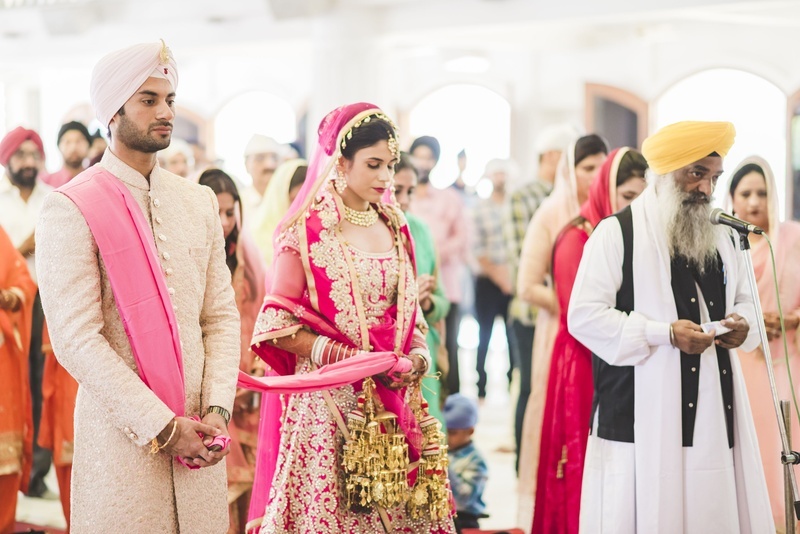 Getting her Kaleereas on, before the wedding ceremony. 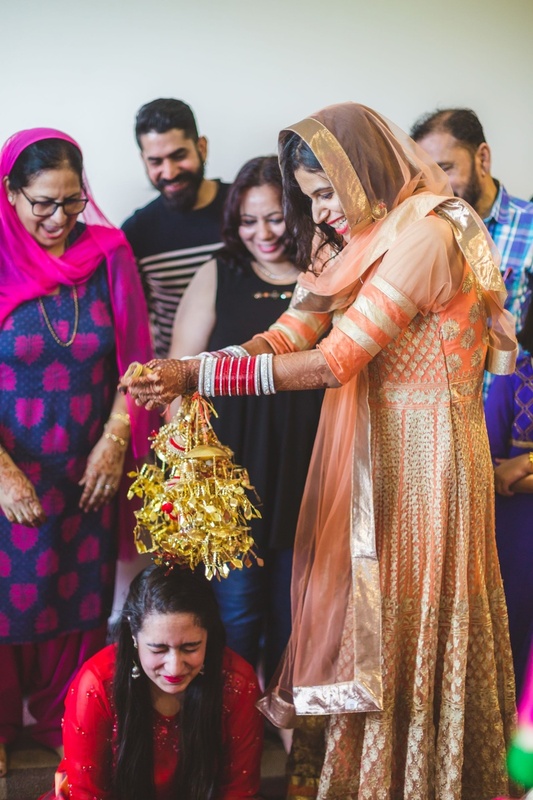 Kaleere showering on her bridesmaids. 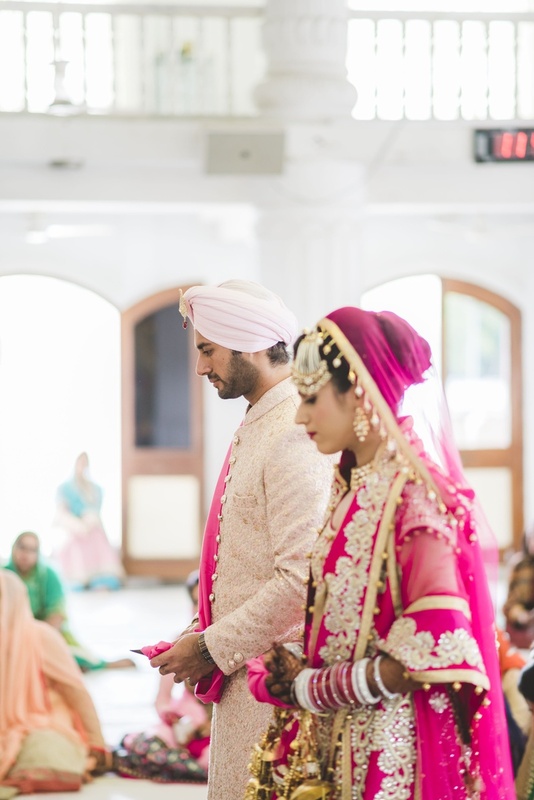 Wearing light pink embroidered Sherwani by Manyawar, paired with baby pink turban for the wedding day. 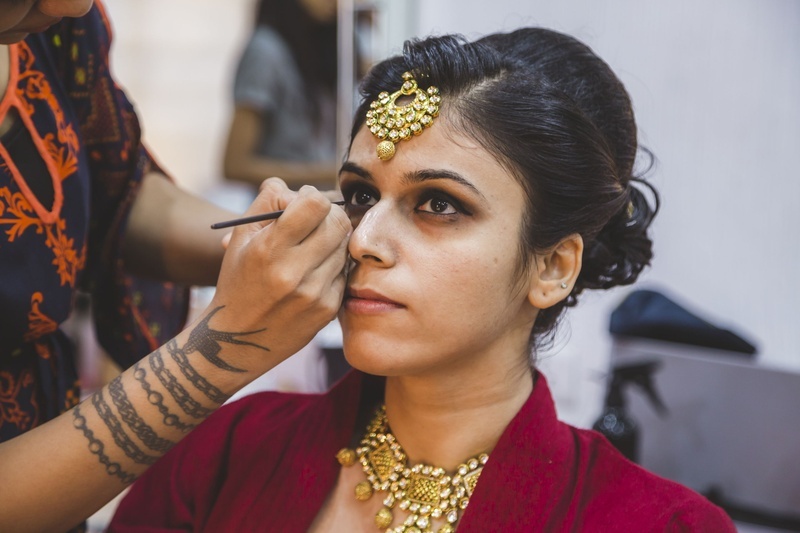 Adorned in beautiful kundan neck piece, matha tikka, jhumkas and passa by Orange the Salon. 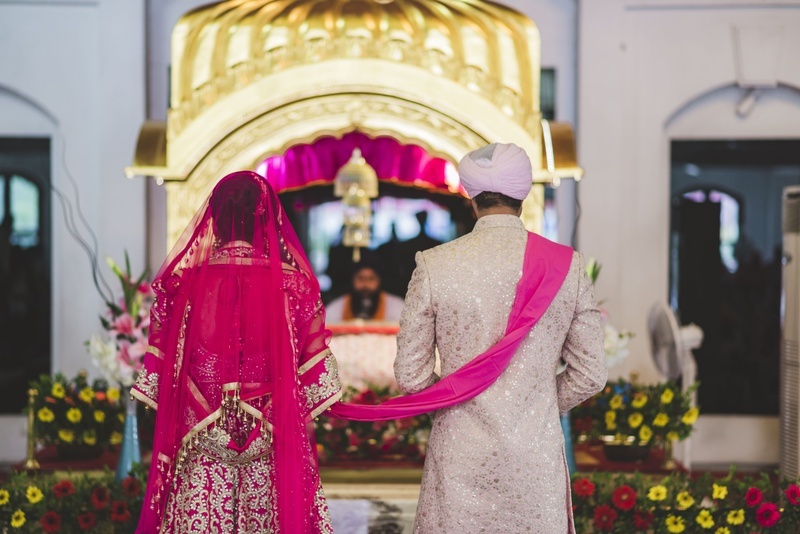 Wearing color coordinated outfits for the wedding day. 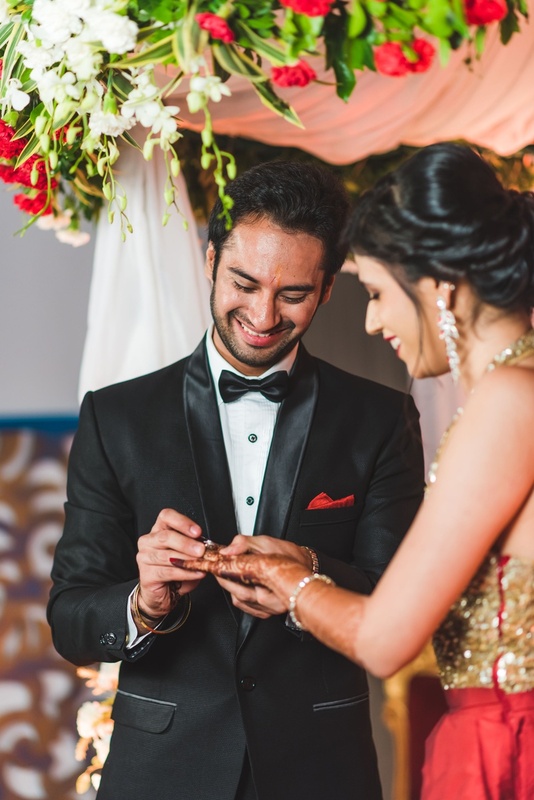 Bride and groom wedding photography by ace photographer Varun's Click. 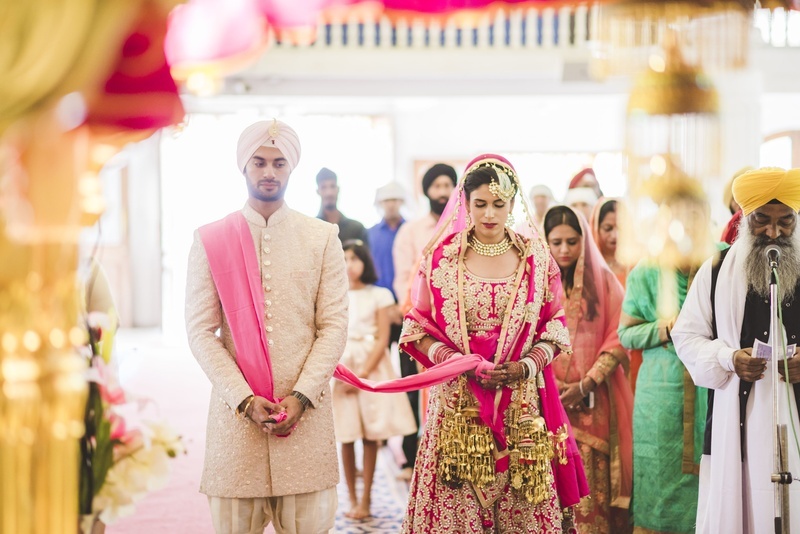 Wearing color coordinated outfits for the Sikh wedding held at Gurudwara. 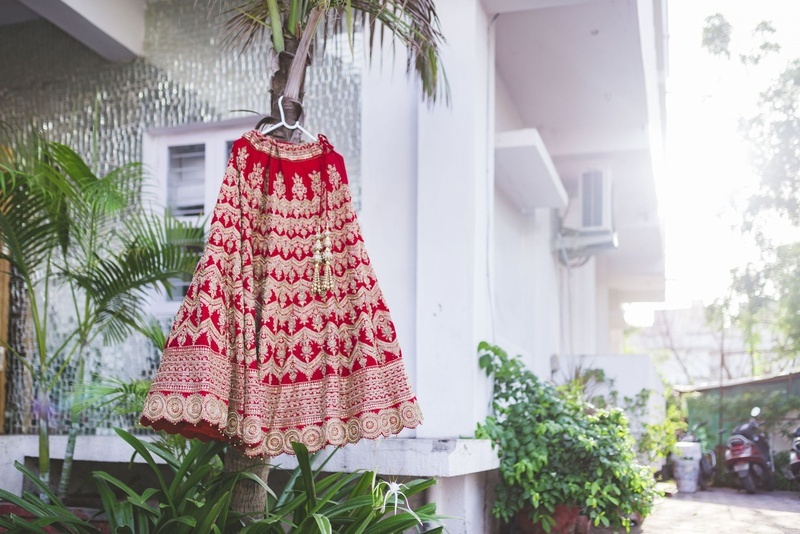 Blood red lehenga with heavy gold zardozi work by Ram Bhai Saree Sangam, Chandni chowk, Delhi! 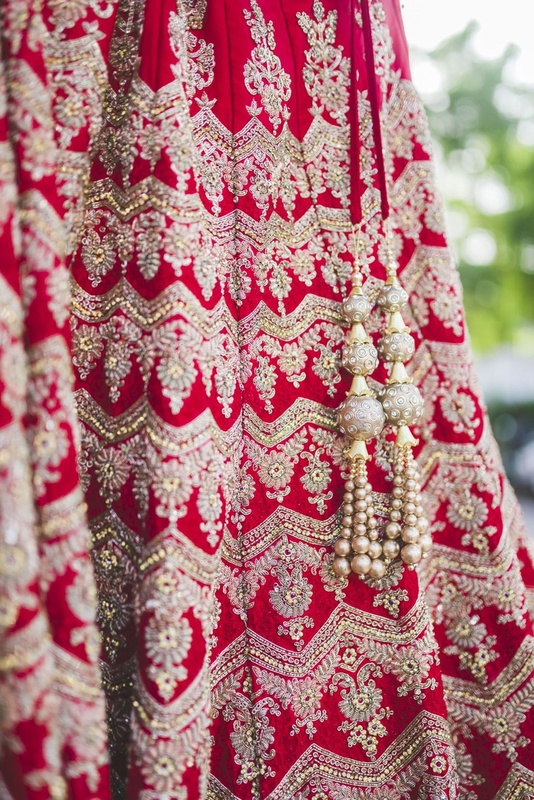 Red and gold lehenga styled with gold bridal jewellery for the reception ceremony. 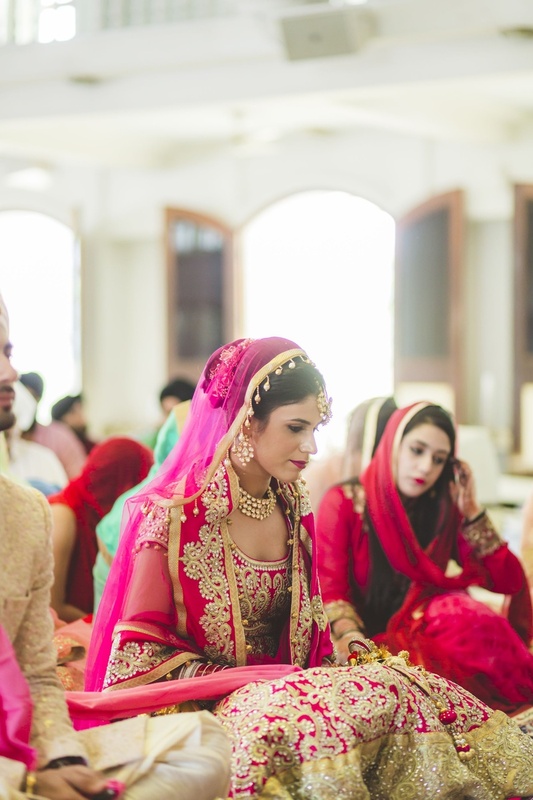 Wearing color coordinated outfirts for the reception ceremony held at Narayani Hotel & Resort, Ahmedabad!